In the spotted-wing drosophila’s native range in East Asia, a wide number of natural enemies keep SWD numbers in check. These natural enemies include parasitoid wasps that lay eggs in SWD larvae or pupae, and then the developing wasp larvae slowly consume the flies from the inside, ultimately killing them. In North America, native parasitoid wasps rarely parasitize spotted-wing drosophila, and those that do have difficulty developing, likely due to the fly’s robust immune response. Introducing a more effective parasitoid wasp from the native range of SWD may help to limit SWD population growth in non-crop areas where the flies can take refuge from on-farm management tactics. If parasitoid wasps are able to reproduce fast enough and kill SWD hosts effectively, the resulting population reduction would lower cost and effort for farmers to control SWD. Obtaining information about a parasitoid wasp’s reproductive potential is essential to determine if it is a viable biocontrol option, and necessary to develop protocols to mass-rear wasps for release. 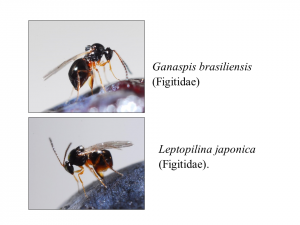 Researchers at the University of California at Berkley and the USDA performed a series of experiments to determine the host preference and reproductive potential of two candidate parasitoid wasps, Ganaspis brasiliensis and Leptopilina japonica. Fig. 1. Two East Asian parasitoid wasps being investigated as potential biological control agents for SWD. Photo credit: Xin-Geng Wang. In a quarantined lab facility, researchers reared G. brasiliensis and L. japonica wasps in captive SWD fly hosts. They used these lab-reared wasps to perform a series of studies on the wasps’ reproductive biology, and performed a similar series of tests for each wasp species. First, researchers quantified how quickly eggs matured in female wasps by dissecting wasps of different ages under a microscope and counting the number of mature eggs inside them. Then researchers gave each species of wasp a series of no-choice and choice tests to determine what age larvae female wasps preferred to lay their eggs in and how fast the wasp larvae matured inside fly larvae of different ages. Finally, the researchers determined the wasps’ lifetime fecundity by giving individual pairs of wasps access to 30-45 SWD larvae every 2-3 days and counting the number of fly larvae successfully parasitized by the wasps. G. brasiliensis reached peak egg production 2-3 days after emerging as adults, and L. japonica egg production peaked in 1-2 days post-emergence. L. japonica has a slightly larger number of average mature eggs per female than G. brasiliensis. Fig. 2. Egg maturation dynamics of differently aged female G. brasiliensis and L. japonica when deprived of hosts but provided with food. Values are mean ± SEM, and within each species bars bearing different letters are significantly different (Tukey’s HSD, P < 0.05). Source: Wang et al. 2018. 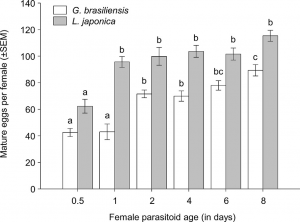 Both L. japonica and G. brasiliensis were more successful at parasitizing 1-2 day old SWD larvae than 3-4 day old larvae, and when given a choice, laid more eggs in younger larvae. Despite this preference, wasp had similar development times in both young and old larvae. Fig. 3. Host age preference by (A) G. brasiliensis and (B) L. japonica between two different ages (1 day vs. 4 day old) of host SWD larvae in a choice test. Values are mean ± SEM, and within each sub-figure bars bearing different letters are significantly different (Tukey’s HSD, P < 0.05). Source: Wang et al. 2018. G. brasiliensis adult females survived on average 17.8 days and produced an average of 98.3 offspring per female, and L. japonica adult females survived on average 18.8 days and produced an average of 107.2 offspring per female. Both wasps had similar egg laying behavior with peak offspring production around 5-10 after emergence as adults. The high mature egg load and similar reproductive ability of both G. brasiliensis and L. japonica makes them both promising candidates for biological control of SWD. The information from this study provides baseline data for developing mass rearing methods that would be needed if these flies are approved for release. Further testing is needed to compare the two wasp species ability to reproduce in different host densities and environmental conditions. Testing is also needed to determine if they attack any native, non-pest drosophila species. Read the whole study here: Wang XG, AH Nance, JML Jones, KA Hoelmer, KM Daane. 2018. Aspects of the biology and reproductive strategy of two Asian larval parasitoids evaluated for classical biological control of Drosophila suzukii. Biological Control.